Get off the ground with this Rescue Jet! Take off and launch the included rockets! Comes with Iron Man and Wolverine Figures. Give your favorite heroes a way to get off the ground with this Rescue Jet! Iron Man and Wolverine can battle evil wherever they find it with you in charge, and the Rescue Jet will take them there in a hurry. Put Iron Man and Wolverine in the cockpit and take off. If they need more firepower, launch the included rockets! 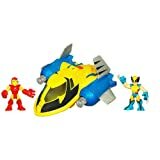 The Rescue Jet comes with Iron Man and Wolverine Figures. My son loves this toy! Once he saw it on the shelf, he needed to add this to his Marvel Super Hero Squad Collection. I think Hasbro has done a great job of using the old molds of the Super Hero Squad figures and enhancing them with more points of articulation. Iron Man and Wolverine both fit in the Blackbird. The rockets really launch and are large enough to not hurt the bystander he is playing with. This is the one Super Hero Squad toy that he has not lost interest in after one hour of receiving it. Well done Playskool. Bought this for my son since his two favorite characters are iron man and wolverine. Add in a cool plane and it was a huge hit. I was a bit disappointed at first because only one rocket would shoot, but after he played with it for a while it started working too. I love that the figures are interchangeable with the other playsets size-wise. I bought this as a Christmas present for a nearly-five-year-old and he loved it, along with my two sons (5 yo and nearly 3 yo). A definite hit. Great that it has two guys with it. Good price, too!